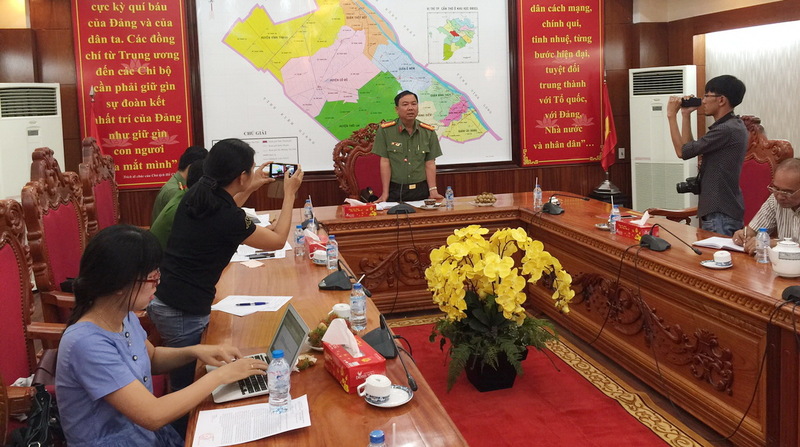 Colonel Tran Ngoc Hanh, director of the Department of Police in Can Tho City, located in Vietnam’s Mekong Delta, speaks at a press meeting regarding the case. Businesses in Can Tho City, located in Vietnam’s Mekong Delta, can rest now easy after the arrest of three traffic inspectors accused of forcing the companies to pay monthly ‘protection’ fees. Vo Hoang Anh, captain of the traffic inspector unit in Ninh Kieu District and his deputy, Ly Hoang Minh, along with Doan Vu Duy, captain of the traffic inspector unit in Binh Thuy District, have been arrested for putting the squeeze on local businesses. Over the past year, local firms specializing in the sale of construction materials, gasoline, seafood, and others were forced to pay a fixed ‘protection fee’ in return for the officers allowing local trucks to operate smoothly on city streets. Companies from neighboring provinces were also extorted whenever their cargo was transported through Can Tho. The victims decided to report the case in early 2016 to the municipal Department of Police. Following an investigation, officers discovered that Nguyen Van Can, 29, was an an important link in the illegal ring. Can worked as an intermediary, creating several bank accounts to which local business operators could wire their payment. “Businesses were asked to pay between VND1 million [US$45] and VND3 million [$134.5] for each of their trucks on a monthly basis. If they refused to comply, the inspectors would jotted down their traffic violations,” Colonel Tran Ngoc Hanh, director of the Can Tho Department of Police, elaborated. On July 16, officers caught Minh red handed as he was collecting money from some of the firms, confiscating VND17.5 million ($784) and $100.  Anh was arrested on July 18 and Duy on July 20 following an extended investigation from police. According to the police chief, about 60 businesses in Can Tho and the nearby provinces of Bac Lieu, Ca Mau, and Vinh Long were among those forced to pay, with the total amount of money extorted topping VND3.4 billion ($152,490). Owners of local companies were quite familiar with the unlawful ring, stating that they had to follow the ‘rules’ to prevent unnecessary trouble for their operations. “My cargo trucks never broke traffic regulations. At first I tried not to pay them but later was threatened and penalized unreasonably by the traffic inspectors,” a local building material seller recalled. X., who runs a gasoline business, recounted that the driver of his tanker truck was fined VND900,000 ($40) for having a worn tire. The man later had to pay the monthly blackmail in order for his operation to run smoothly. It was hard to detect the illicit activity as the officers often received the payment via bank transfers, another victim stated. Trinh Ngoc Vinh, deputy director of the municipal Department of Transport, said on Thursday afternoon that he was surprised that such crime was committed by his officers. Anh has been suspended from work for 90 days while Minh was relieved from his duty until local police reach a conclusion, Vinh continued. There has not been any sanction for Duy as police have not made any report regarding his case, the deputy director added.